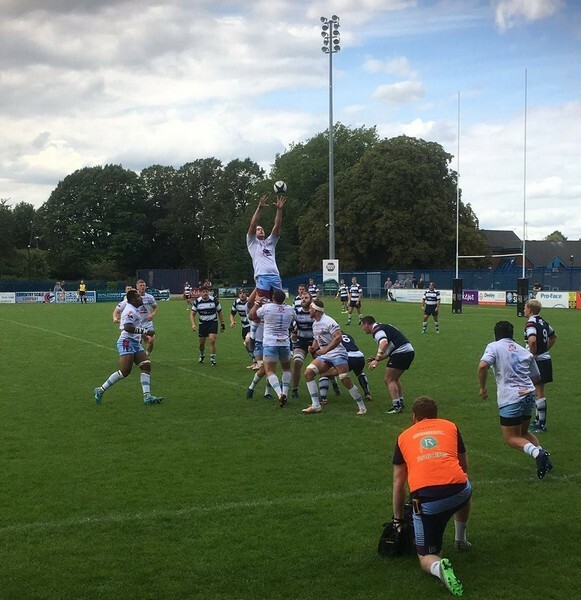 Rotherham Titans completed their pre-season campaign with a hard-fought, but deserved 25-17 win over Coventry at the Butts Park Arena. The game promised to be a close affair beforehand, with National One side Coventry having high ambitions of joining the Championship next term, having recruited a strong squad over the summer and that’s how the game panned out. A stuttering first half effort from the Titans saw them go in at the break trailing 14-10 after the hosts had scored two driving maul tries; one a penalty try on 20 minutes and the second from front-rower Phil Nilsen 12 minutes later which was converted by Will Maisey. Titans’ first half points came from a Caolan Ryan penalty on 17 minutes and a neatly worked try for Jamie Cooke after he broke the Coventry defence to glide in from 30 metres. Ryan tagged over the extras. During the break head coach Andy Key make several changes to the team and it took one of those changes, scrum half Rhodri Davies, just 5 minutes to make an impact as he broke through the home defence, before accelerating around the last man to touch down in the corner for a fine try. Maisey and Lee Millar then traded penalties before the hour mark to leave the game tightly balanced 18-17 in Titans favour. However, Titans began to control the contest and looked the more dangerous outfit, as they upped the tempo and physicality of their work. Rotherham sealed the game when Ifereimi Boladau crashed over late on after some powerful work from the pack. Millar’s excellent conversion from out wide put the cherry on top of a much improved second half performance. Commenting post-match Andy Key reflected, “We are really pleased with how things went; we expected a strong challenge from Coventry, they’ve got strong aspirations to come into the Championship and coming away from home is never easy to get the win. “I think today showed we had a lot of composure and we didn’t panic. We went into half time down and then it was about building a score in the second half; and to play the second half with them only scoring 3 points was excellent. “The one thing this sort of exercise does is show the power of bringing the finishers off the bench and I thought the boys coming off the bench did a brilliant job. They picked the tempo up and they picked the physicality up, but more importantly we controlled the game. Casting an eye to next weekend’s Championship opener at Clifton Lane against Nottingham, Key added, “I’m looking forward to it and for a lot of us it will be our first game in front of the Roth supporters; I hear the Shed makes an enormous noise and I say let’s bring it on and let’s make sure that happens!